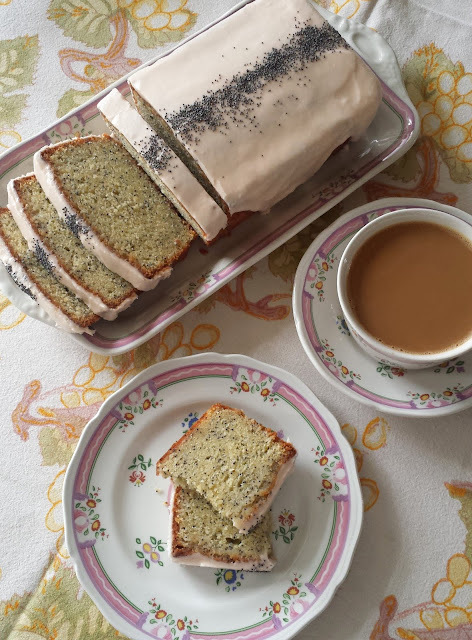 In a free moment last week I was trying to catch up with some of my food magazines. 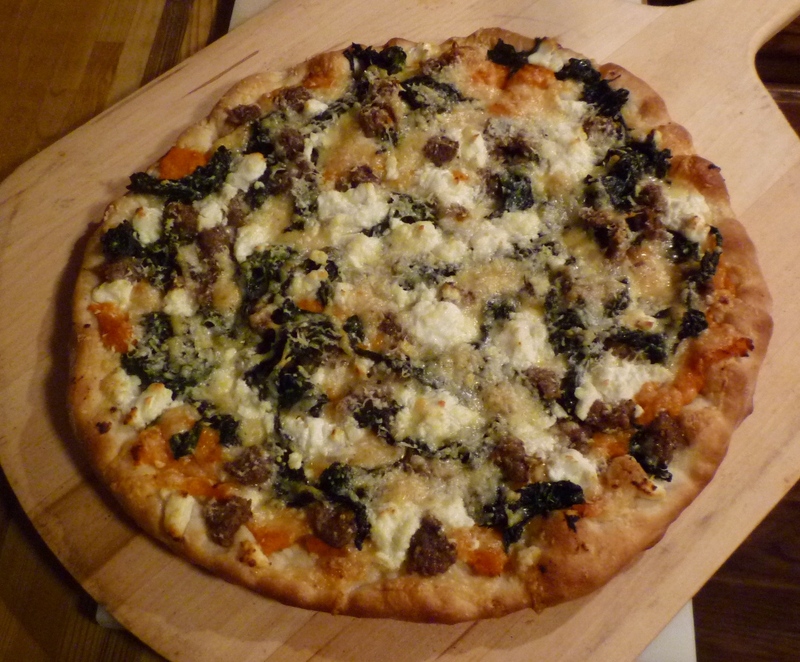 As the dinner hour approached I happened upon a delicious looking Swiss Chard & Italian Sausage pizza in Bon Appetit. I decided that that would be just the thing for dinner: I still had time to make the dough...and I knew I had all the ingredients on hand. Unfortunately, when I began to pull out the ingredients, I discovered I did not have them all... I was inexplicably out of ricotta cheese. As I stood staring into the refrigerator trying to reformulate my game plan for dinner, I spotted a small container of leftover mashed sweet potatoes...and another of diced roasted butternut squash. The amount of each was so small I was surprised I had bothered to save either one...but I do hate to waste food. So, there they were. And there I was: still hungry for pizza. Having recently made a sweet potato and kale pizza, it occurred to me to substitute mashed sweet potatoes and squash for the ricotta. Not an obvious substitution I know...but I thought it would be delicious. And it was. To make it, I combined my leftovers, smashing the diced cooked squash into the already mashed sweet potatoes. I then just daubed it all over the pizza instead of the ricotta. 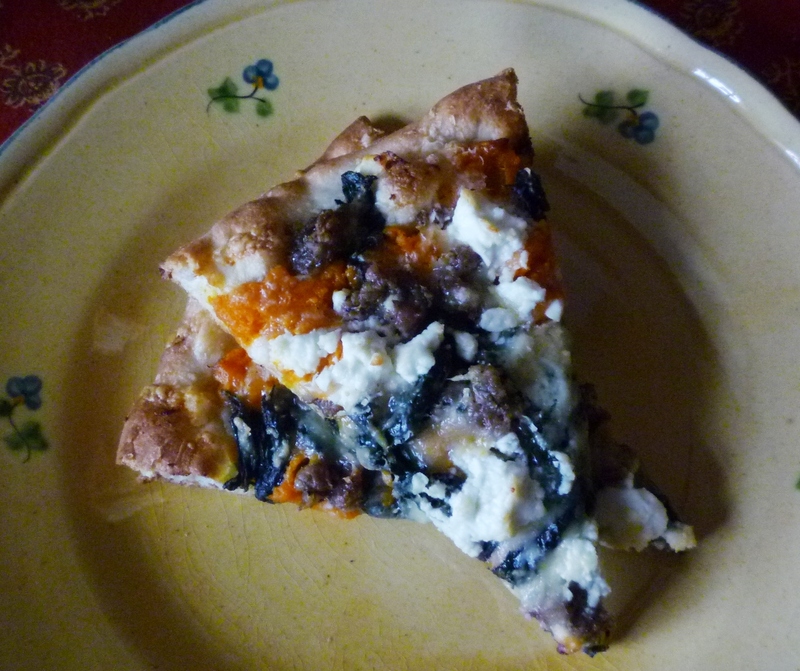 If all of my leftovers had been diced roasted squash, I would have simply scattered the pieces over the pizza. The flavors of the salty sausage, bitter greens and sweet squash/sweet potatoes were fantastic together. I'm not sure, but I think that I probably like this version better than the one that inspired it. Although, if I had not had leftovers....and had had some ricotta in my fridge...I'm sure the original version would have been delicious, too. And not incidentally at this time of year, would have made for faster dinner prep than roasting squash or sweet potatoes from scratch. I guess it seems appropriate that my "post Thanksgiving" post should be about leftovers. Even though my leftovers weren't Thanksgiving leftovers...since they were sweet potatoes and squash, they could have been. 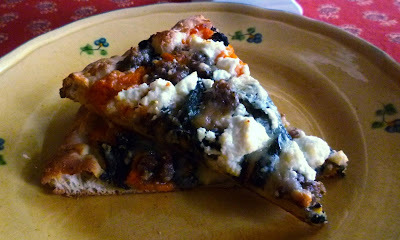 So, if you still have leftover sweet potatoes or squash from the big feast, this pizza would be a great place to use them...and even if you don't, you could still make this pizza (with ricotta...or freshly roasted squash...or sweet potatoes...). I know I will be making it again. Place a tablespoon of olive oil and the sausage in a large, cold sauté pan. Set over medium heat. Cook, breaking up the sausage with a fork or a wooden spoon. Continue to cook, stirring occasionally, until the sausage has lost its pinkness. Add the garlic and pepper flakes, if using, followed by the chard, adding the chard a handful or two at a time, turning it in the fat to coat and adding more as it begins to collapse. When all of the chard has collapsed, continue to cook until the chard is tender and any water given off has evaporated (the chard and sausage should be sizzling in the pan). Remove from the heat and let cool. Taste and correct the seasoning. In a small bowl, add a tablespoon of olive oil to the sweet potatoes (or ricotta) and season to taste with salt & pepper. 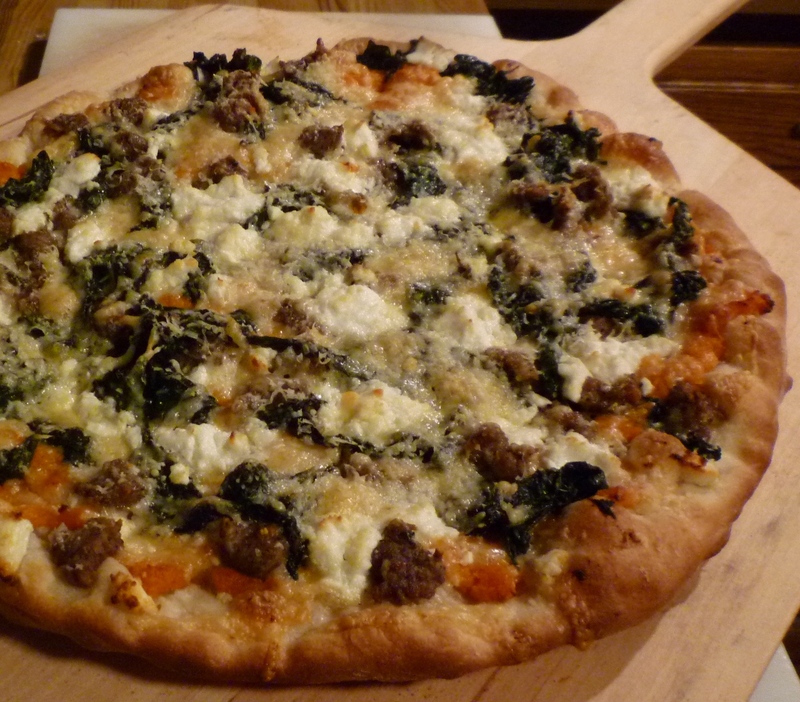 If using a pizza pan or baking sheet, place the pizza in the pan on a pre-heated pizza stone in a pre-heated 500° oven. Bake until the crust is golden brown on the bottom and the cheese is bubbling, about 12 to 15 minutes. To insure a crisp crust, slide the pizza off of the pan and onto the pizza stone as soon as the crust is set (after 4 or 5 minutes). If using a peel, slide the pizza directly onto the preheated baking stone. Bake until the crust is golden brown on the bottom and the cheese is bubbling—about 8 to 12 minutes. Whether or not you will need garlic and/or pepper flakes will depend on your sausage. If the sausage is hot and garlicky, you won't need to add more. If you do not have leftover sweet potatoes, place a small (8 oz.) sweet potato on a square of foil or in a small baking pan. Prick all over with a fork of the tip of a knife and roast in a 375° to 400° oven until soft and oozing (about an hour). Peel when cool enough to handle and smash with a fork. You should have about 4 oz. or 1/2 cup of sweet potato mash. If you would prefer to use squash, peel, seed and cube an 8 to 10 oz. chunk of winter squash. Toss with olive oil and salt and pepper. Transfer to a baking sheet and roast in a 375° to 400° oven until tender (about 20 minutes). Omit the sweet potatoes or ricotta from the recipe and scatter the cubes of roasted squash over the Dubliner just before adding the sausage and greens. Place the water in a large bowl and add the yeast. Let soften for a minute or two. Add 3/4 cup of the flour and whisk until smooth. Add the oil, salt and another half cup of the flour. Stir with a wooden spoon to form a soft dough that holds its shape, adding more flour if necessary. Sprinkle some of the remaining quarter cup of flour on a smooth surface. Scrape the dough out of the bowl and sprinkle with a bit more of the flour. Knead the dough, adding just enough flour to keep the dough from sticking, until the dough is smooth and springs back when pressed lightly with a finger—about 5 to 10 minutes. Transfer the dough to a lightly oiled bowl and cover the bowl with plastic wrap. Let rise until it has doubled in size—about 1 hour. Punch down the dough and turn it onto a lightly floured surface and form into a ball. Cover with a towel and let rest for 15 to 20 minutes. The dough is now ready to be shaped, topped and cooked or frozen. Food Processor Method: Place the water and yeast in a small bowl and let sit until the yeast has dissolved. Place 1 1/3 cups of the flour and salt in the food processor fitted with the metal blade and pulse to blend. Add the oil and yeast/water mixture and pulse until the dough is homogenous. Begin to run the mixture in long pulses until the dough is smooth and elastic—it shouldn't take more than a minute. If the dough seems wet and sticky, add some of the remaining flour a tablespoon at a time, pulsing after each addition. Turn the dough out onto a lightly floured counter and give it a few kneads by hand.